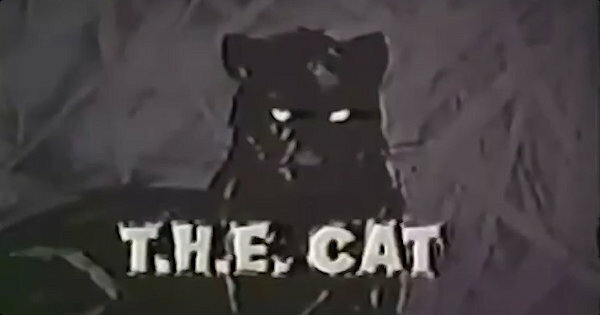 This 1966-1967 NBC adventure show starred Robert Loggia as a former cat burglar who decided to turn straight and become a bodyguard-for-hire. NBC’s T.H.E. Cat was a half-hour action/suspense series that starred Robert Loggia as Thomas Hewitt Edward Cat, a former acrobat and thief turned professional bodyguard. According to press material from the network, “usually his clients are marked for death. Only T.H.E. Cat stands between them and their would-be killers” . NBC gave it the 9:30-10PM time slot on Fridays following The Man from U.N.C.L.E., where it would compete with The Milton Berle Show on ABC and The CBS Friday Night Movie. Cat operated out of a night club called Casa del Gato, or House of the Cat, owned by Pepe Cordoza (played by Robert Carricut). R.G. Armstrong played Captain MacAllister, Cat’s police liaison. The series premiered on Friday, September 16th, 1966 to mostly positive reviews. Aleene MacMinn, writing in The Los Angeles Times, called it a “very slick production” and predicted that “strong lead-in from The Man from UNCLE should help build and audience for this one and if the quality of the initial segment is maintained the audience will probably stay” . Jack Gould, on the other hand, opined that “in the opening installment so many unexplained people made so many entrances and exits that the total was just confusing and bereft of suspense” . The Chicago Tribune‘s Clay Gowran suggested that viewers would fall into two camps: those who loved the show for its cinematography and acrobatics and those who detested its violence and strange story lines. He ended his review by explaining that” Cat sounds pretty silly here, but he comes out better on film. We liked the show, for all its wildness and feel it deserves a chance to settle down and see it can do. But we can see it disappearing under an avalanche of protests if subsequent episodes are as woolly as last night’s” . The first two episodes averaged a 17.5/32 Nielsen rating [6, 7]. In late October, during a press tour for the series, Loggia revealed that NBC was happy with the show’s performance: “We’re drawing about a 30 per cent share of the audience, which NBC considers fine for a new show with a new star. We hope we’ll improve that with some changes we’re making, now that we’re thru the first 16 shows and starting production of the next batch” . For starters, the series would involve more romance: “They had me buss a blonde in the premiere, but as nearly as I can remember it hasn’t happened since. Now, tho, the kissing will start again. The audience seemed to like it–and me, I’m all for the idea.” Another change involved getting rid of R.G. Armstrong: “Cat’s supposed to be a loner, and when he works hand-in-glove with the cops he becomes an organization man” . As for the show’s violence, Loggia argued “the spirit of our violence is different. We don’t go in for slow-moving, bone-crunching stuff; instead, Cat is supposed to be not only deadly but beautiful to watch in action, and that’s the way it seems to be getting across” . Ultimately, NBC wasn’t happy enough with T.H.E. Cat‘s performance to renew it for a second season. Whether that had anything to do with the mid-season changes is debatable. It was routinely beaten by The CBS Friday Night Movie and, for the period running October through December 1966, averaged a 15.5 Nielsen rating, placing 69th out of 91 programs (The CBS Friday Night Movie had a 20.4 rating and ranked 24th; The Milton Berle Show ranked 82nd with a 12.9 rating) . In late February, Broadcasting called Friday night “the biggest NBC hole to be plugged” and noted that both T.H.E. Cat and Laredo were likely to be cancelled . When the network unveiled its 1967-1968 schedule on March 15th, both shows were indeed gone . Guest stars during the show’s one and only season included Pippa Scott, Cesar Romero, Diana Muldaur, Sorrell Booke, Sally Kellerman and Susan Oliver. In 1967, Dell published four comic books based on T.H.E. Cat. More than four decades later, Moonstone Books published a two-part comic book crossover between T.H.E. Cat and Honey West called “Honey West and T.H.E. Cat: Death in the Desert.” A novel followed in 2014, titled Honey West and T.H.E. Cat: A Girl and Her Cat. 1 Gowran, Clay. “NBC Is Breathless Over Its T.H.E. Cat.” Chicago Tribune. 29 Aug. 1966: B6. 2 MacMinn, Aleene. “TV Review: T.H.E. Cat Filled with Suspense.” Los Angeles Times. 17 Sep. 1966: B3. 3 Gould, Jack. “TV Review: The Nimble ‘Cat’ Makes His Debut on N.B.C.” New York Times. 17 Sep. 1966: R15. 4 Gowran, Clay. “T.H.E. Cat Likely to Draw Praise, Ire.” Chicago Tribune. 17 Sep. 1966: A20. 5 Humphrey, Hal. “How many lives for T.H.E. Cat?” Los Angeles Times. 29 Jan. 1967: A39B. 6 Nielsen rating from Clay Gowran’s “Nielsen Ratings Are Dim on New Shows,” The Chicago Tribune, October 11th, 1966, Page B10. 7 Nielsen share from Jack Gould’s “How Does Your Favorite Rate? Maybe Higher Than You Think,” The New York Times, October 16th, 1966, Page 129. 8 Gowran, Clay. “Plan More Kisses for Bone Busting Cat.” Chicago Tribune. 31 Oct. 1966: A8. 11 “Hindsight 66/67.” Television Magazine. Mar. 1967: 26-29; 34-35. 12 “CBS reshuffle: emphasis on youth” Broadcasting. 27 Feb. 1967: 25-26. 13 “Eight New Programs on NBC’s TV Schedule.” Los Angeles Times. 15 Mar. 1967: E17. A co-worker told me about this series, and I was able to obtain the whole series through a trade (Including two versions of the pilot). It was very well written and directed and deserved better. Another guest star to add to the roster is a pre-MTM Show Ted Knight. This is the PERFECT show to be showcased on a web site like this, a truly GREAT show! Dark, film noir, atmospheric and GREAT Jazz from the mid sixties. Katy Segal’s Dad was the producer and director on half of the episodes. You can find the complete series on eBay and other sites like that. Not great quality but still passable. Defiantly worth checking out! I see the shows on YOUTUBE-it looks very interesting but the show’s title, to me, was still its downfall. Very cool show with a terrific theme score. Always liked the fact that Cat was a professional bodyguard. It was a refreshing change from having yet another private detective show. Always thought that a T.H.R.Cat & Green Hornet crossover would have been fun. Rest in Peace, Robert Loggia. I loved the show while it was on. can anyone get someone to work on the series and put iyt in high definition and put it to be sold .That would be great .They have other series that are on dvd. This is a great. moody TV-noir show that was knocked off by the suits of the worst run network NBC. If Coronet Blue can be released on DVD in fairly good prints, so can T.H.E. Cat. Another guest star not noted in the above story was Robert Duvall. He actually appeared in two episodes, playing different characters. I, too, would welcome the chance to purchase a high-quality copy of this series on DVD. This show deserved better, and so did Robert Loggia. RIP. When The Pruitts of Southampton moved to Friday nights and retitled The Phyllis Diller Show, the show stuck against T.H.E. Cat. I was 14 when this show aired. My friends and I would get together after each episode and talk about how cool Robert Loggia’s character was, and how he would handle the bad guys with ease and his superior atheletic ability. We would pretend to be T?H.E. Cat, jumping neighborhood fences, running atop 6′ walls emulating Cat’s stealthy moves. What a wonderful show, actor, character, and theme song. Every young person should see this series and realize just how much fun it is to play outdoors, being active and athletic, creating a positive attitude and offering help to those who need it. It worked for me. Let ‘s honor Mr. Loggia and all those who had a part in creating this wonderful show. Let’s get this show restored and re-released on DVD. Thank you Mr. Loggia, RIP. How my brother and I loved this show! Looked forward to it each week! T.H.E. Cat showed me how to scale walls and how to climb up the side of a building, and how to throw the three-pronged claw!